Car sales techniques to overcome objections gives you some well proven ideas and strategies to help you deal with the objections, and close more sales. Are you serious about earning more money by overcoming more objections? This training works for any product, in any country or culture, and in any market place. The compact course has only 35 pages. No waffle or padding, just the information you need to increase your sales by overcoming more objections. Includes a complete exercise program that shows you the process. Trains you how to use it, and even helps you decide on the words and phrases you will use. 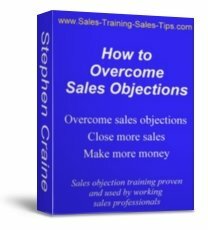 A professional sales training course to overcome objections, in a personal training workbook, complete with an exercise program, for just £14.99. Only available from this website. I’m so confident that you will be successful using this objection handling course, that I offer a money back guarantee if you haven’t increased your sales results in 3 months time. All you have to do is return the completed course and I will refund the price. So you have nothing to lose and a lot you could click to gain. Overcoming car sales objections is part of the complete car sales process. The car sales section of this website starts with appointment setting and prospecting, and builds into a car sales training resource for every stage of the sales process. As each section of the process is added to the site the titles below will turn to page links. A complete car sales guide on how to sell cars using professional car sales techniques. As new pages are added the page titles will change into links. Objections to a car sale can occur anywhere in the sales process. As you approach a potential customer on the forecourt they can give you a smoke screen objection of, ‘I’m only looking,’ before you even say anything. Start to think how many different reasons could be behind such a simple statement from the customer. And all you did was offer your assistance. How were you supposed to know what was going on in their head, and what car sales techniques to use. The following information on car sales techniques to overcome objections will add to your current sales skills. It will give you additional strategies and sales skills to overcome car sales objections anywhere in the sales process. The aim is to give you alternative viewpoints on how to handle objections to car sales so you can adapt them for your sales role. At no point am I saying scrap what you do now and do it this way. Sales is about acquiring new sales skills and using the best car sales technique in each sales situation. Further down the page is process for dealing with car sales objections that will give you a consistent way to overcome objections and move towards the sale. Many sales courses confuse questions with objections. ‘Is there a full guarantee on labour and parts?’ is not an objection to buying the car. It’s a question. It’s also a clue as to the benefits the buyer is looking for in a deal. Customers asking questions is great. Encourage it. There is nothing worse than a low reaction customer that gives little information and one word answers. Even questions phrased negatively should be welcomed and not seen as objections. ‘Do you not think that’s an expensive price?’ is not an objection. ...But the best way to utilise the car sales technique is to answer it in your own words appropriate for the situation.. The customer is hiding the real objection. This can be intentional or unconscious. Even if you use sharp car sales techniques to answer the objection you are no closer to a sale because you haven’t answered the real objection. You’ll find more objections keep popping up to create more smoke screens. To use your car sales techniques to overcome objections you must first define the real objection. Consider this question: Is the objection, ‘That sounds very expensive,’ a genuine objection or a smoke screen? A real objection is a genuine reason for not moving forward along the car sales process. In auto sales training always remember this is from the customer's point of view. This is a genuine objection to a car sale based on the information the customer has, and the viewpoint they have formed. You may know they are wrong. But that is from your viewpoint. Even if your viewpoint is from a more informed position, the customer’s objection is real in their mind, treat it as a genuine objection to the car sale. ...I’ve found it more effective to categorise objections as, Defined or Vague, rather than real and smoke screen. You’ll see how this works later.. The objection, ‘That sounds very expensive.’ Is then viewed as a vague objection that needs defining by asking good questions. A word about acknowledging the customer's objection when it’s presented. Many sales training courses teach delegates to acknowledge the buyer’s objection. Some tell you to repeat the objection, or rephrase it. The car sales techniques I advise do not acknowledge the objection, and definitely not to repeat it. When you do this you are adding strength to the objection. The only time I would use an acknowledgment is when it’s followed by a really effective additional phrase. I can see why you might think that, because I haven’t shown you......yet. This car sales technique is best used when the objection is clearly defined and you can answer it. All the car sales techniques I recommend are based on processes. A process is a constant that can be assessed, altered, adapted, and made more effective. If you just answer objections with no thought to the process you’re using you will find it hard to know which bits of your car sales techniques are working and which parts to change. Before you can effectively answer the car sales objection, you must define it. Folow this process and overcome more car sales objections. Only once you have defined the real objection should you move on through the car sales objection process. If the customer does not give you the genuine reason behind the objection you should decide if you are making effective use of your time. There are many reasons the customer may not be forthcoming with the information. This is where your car sales techniques and your sales skills can be used to great effect. It may be trust and relationship building that gets you to the next stage of the process. I often see sales people I’m coaching ready to jump straight in with an answer once they have defined the objection to the sale. The car sales techniques that will work best require you to hold yourself back, take a breath, and consider a different action. Before you move on to answering the objection, you want to gain some agreement form the customer. 2.This is the only objection stopping them from moving forward along the car sales process. 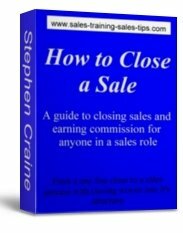 Depending on where you are in the sales process No2 may be agreement to the sale, rather than just moving forward. As with all car sales techniques, use your own words and phrases. The more agreement you gain at this point in the process the easier it will be to close the sale, or move forward with the car sales process. Once you have the agreement that you understand the objection, and there are no more objections at this stage. you can move on. The key message here is: Focus on the benefits to the customer, not just the features. A good finance deal can mean many things to a customer. If the objection was about the cost of the car then focus your answer on the benefits of the finance deal that are related to the monthly payments. All your car sales techniques will benefit from you having a thorough understanding of how to use benefits with features when presenting to a customer. Invest some of your time on the Sales Presentation Tips page. Present the answer that covers the objection. Keep your focus on what it is the customer needs to meet their needs. Answering car sales objections does not always mean making concessions to the customer. Objections can be overcome by giving new information, changing the customer's viewpoint, or showing benefits the customer hasn't picked up on. Don’t take it for granted that you have answered their objection. Ask the customer. Gain their agreement that you have dealt with the objection they raised. If the objection was to the closing of the sale then close the car deal now. They have agreed earlier that there were no more objections to the sale, or to moving forward, and that you understood and had defined their objection. You can now close the car sale or move forward to the next stage. You can see now why gaining agreement to the defined objection is such an important part of the car sales techniques to overcome objections. If you hadn’t asked if there was any other objections you could now be faced with another car sale objection to overcome. To see more on how to overcome objections to car sales, invest some time at the Overcoming Sales Objections section of the site. It is very rare that a car sales customer finds their dream car with no negatives. Some customers know this and push you with objections just to make sure they are getting the best deal possible. Often the customer will make unrealistic demands either deliberately or because they are not as informed as you are. Take all this in your stride and use your car sales techniques in an appropriate way for each customer. Stick to the process to overcome the car sales objections. Point out the positives that outweigh the objections you can’t answer. And always use your car sales techniques to focus on the specific benefits that meet the customer’s needs, wants, and desires. You can start a new search for more sales training by leaving car sales techniques and moving to the sales training sales tips home page. If you want selling skills that for each of the sales stages of a sale open the sales skills page.